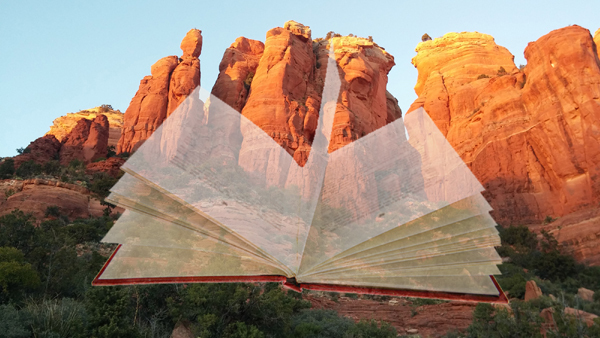 It’s only been in the last few years that I began to realize, as I hiked the numerous trails of Sedona, that in my own way I was “reading” nature – that in some ways it had a voice I was listening to. And then, when I came across this ancient idea, it struck a deep and familiar chord. Some people, in order to discover God, read books. the very appearance of created things. Look above you! Look below you! never wrote that book with ink. For Augustine, there were two books that one could study in order to develop personal qualities of piety and virtue that would bring you closer to God – the Book of Scripture, and the Book of Nature. He saw both books as allegorical – pointing beyond themselves to a higher truth, which in a sense permeated both books. Back then, when nature was like a book, it was meaningful – the contents of nature had significance for people and spoke to them. There was a relationship that was two-way, and a sense of connection and an acknowledgement of belonging to a common source. As I walk many paths in Sedona’s amazing landscape, I feel this connection and, in addition, reaching back over more than 2000 years, I find myself walking with Aristotle and Augustine and even seeing a little through their eyes as they read the same book that I now stand in front of. Somewhere in this experience is a kind of deep healing for me, because I have found that the modern-day world – its stresses and belief structures – can separate us from ourselves, nature and each other. Opening the book of nature feels like blood flowing back into a forgotten limb – the limb that carries my own connection to this cosmos and my deepest self. (soils and rivers, birds and beasts) spells out a story. And I know many pleasant things it will do to you. Robin has a background in both science and religious studies, and his passion is to bring these together through our relationship with nature. He works to bring this integral experience to others as an antidote to our modern-day sense of separation from the natural environment, and our deepest selves.